When Loretta surrenders her young girls to the county and then disappears, she becomes one more missing Native woman in Indian Country’s long devastating history of loss. But she is also a daughter of the Mozhay Point Reservation in northern Minnesota and the mother of Azure and Rain, ages 3 and 4, and her absence haunts all the lives she has touched—and all the stories they tell in this novel. 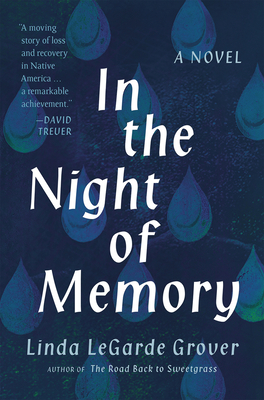 In the Night of Memory returns to the fictional reservation of Linda LeGarde Grover’s previous award-winning books, introducing readers to a new generation of the Gallette family as Azure and Rain make their way home. After a string of foster placements, from cold to kind to cruel, the girls find their way back to their extended Mozhay family, and a new set of challenges, and stories, unfolds. Deftly, Grover conjures a chorus of women’s voices (sensible, sensitive Azure’s first among them) to fill in the sorrows and joys, the loves and the losses that have brought the girls and their people to this moment. Though reconciliation is possible, some ruptures simply cannot be repaired; they can only be lived through, or lived with. In the Night of Memory creates a nuanced, moving, often humorous picture of two Ojibwe girls becoming women in light of this lesson learned in the long, sharply etched shadow of Native American history. Linda LeGarde Grover is professor of American Indian studies at the University of Minnesota Duluth and a member of the Bois Forte Band of Ojibwe. Her novel The Road Back to Sweetgrass (Minnesota, 2014) received the Wordcraft Circle of Native Writers and Storytellers Fiction Award as well as the Native Writers Circle of the Americas First Book Award. The Dance Boots, a book of stories, received the Flannery O’Connor Award and the Janet Heidinger Kafka Prize, and her poetry collection The Sky Watched: Poems of Ojibwe Lives received the Red Mountain Press Editor’s Award and the 2017 Northeastern Minnesota Book Award for Poetry. Onigamiising: Seasons of an Ojibwe Year (Minnesota, 2017) won the 2018 Minnesota Book Award for Memoir and Creative Nonfiction and the Northeastern Minnesota Book Award.